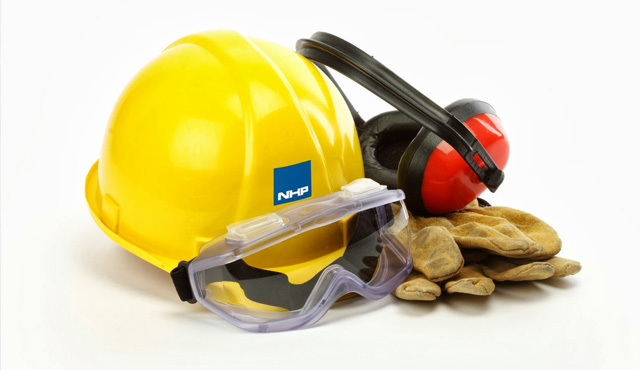 What are Basic Safety Principles for Machine Safety? Basic Safety Principles are fundamental requirements for all safety systems. From Category B to 4, Basic Safety Principles are the first step in building reliable systems. Do you pay attention to Basic Safety Principles when designing your safety systems? Let's have a look at some common Basic Safety Principles in the below diagram of a circuit. 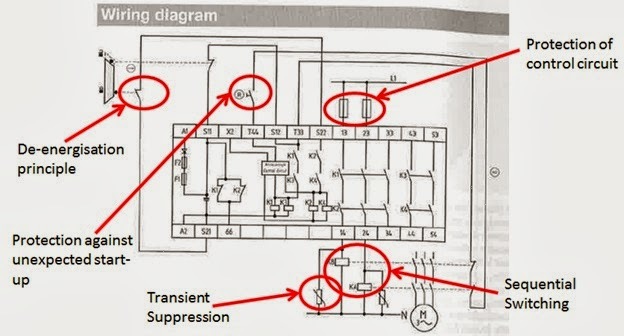 Here we can see protection of control circuit, de-energisation principle, protection against unexpected start-up, transient suppression and sequential switching. De-energisation principle – This principle dictates that the safe state should always be initiated by the contact opening, voltage going low, output opening, pressure lowering, etc. This principle ensures that a loss of energy will default the system to a safe state when possible. Protection of the control circuits – The control circuits should have all relevant protection to ensure that any supply faults can’t cause the system to fail in a dangerous state. 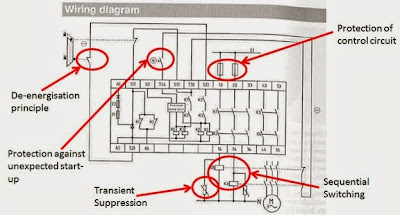 Transient Suppression – Transient suppression should be used in parallel with all loads. This will reduce the chance of transient voltages affecting the safety system. Sequential Switching – Timing the outputs so that one switching device always operates without current will reduce the chance of common mode failure. Protection against unexpected start-up – The system should be designed to avoid unexpected start-ups. The above are some examples of Basic Safety Principles that are relevant for electrical systems. The full list can be found in Table D1 of AS 4024.1502-2006. Basic Safety Principles can also be found for mechanical, hydraulic and pneumatic systems in the Appendix sections of this standard as well.